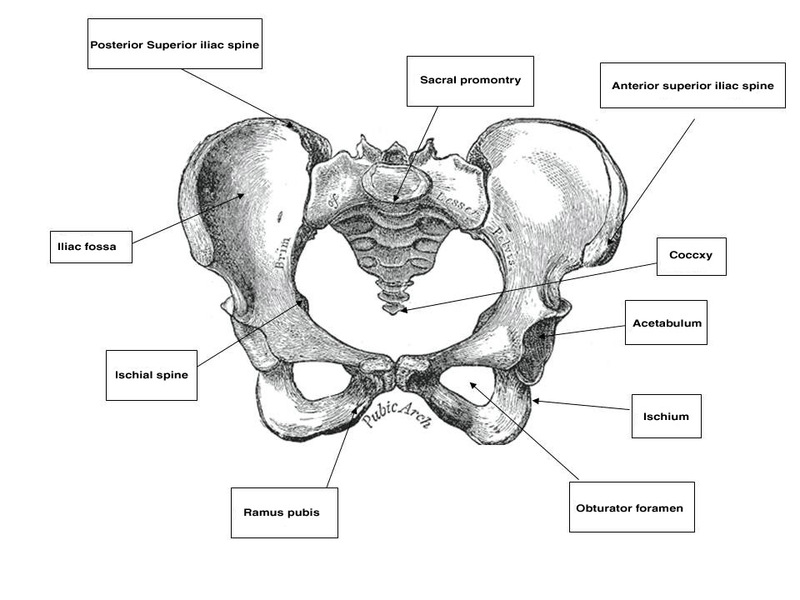 Let’s take a walk around your pelvis and identify some of the bony landmarks. Start in a short lunging position. Bring your hands to your hips, the big arc at the top of your pelvis. These elephant ear shaped structures are the ilia and your hands are resting on the iliac crests. Pick the side of the forward foot and begin to walk your fingers along the iliac crest until you come to the bony point at the front. This is the anterior superior iliac spine (ASIS). Now walk along the hip crease to your pubic bone. You are now walking along the inguinal ligament. Many muscles pass underneath of it. Place one finger at the pubic bone and another at the ASIS. Halfway between these twp points, under the inguinal ligament, is your hip socket. See if you can find it. Now return to your pubic bone. If you walk towards the center you will feel a little divet; this is the location of the pubic symphysis. Walk back to the pubic bone and follow bone, to the side of the gentials, along the ramus, until your land on your sitting bone, or ischial tuberosity. From there you will make a diagonal, poking through flesh to feel the sacrotuberous ligament and possibly the greater sciatic notch. Continue up to the sacroiliac (SI) joint, where the sacrum and ilia meet, and then to the posterior iliac spine, where the iliac crest begins on the back of the pelvis. Now find all of those same points on the other side. Most people think of the pelvic girdle as one fused mass of bone when actually there is more movement available than one might realize. I like to think of our having two pelvi, one right and one left, with our spine in between. Each pelvis meets the sacrum at its respective sacroiliac (SI) joint. This joint is in part a sliding joint and in part a rolling joint. While it was meant for stability, there is some capacity for movement. It is stabilized by a mass of ligaments that are often strained in yoga. The two pelvic halves meet at the pubic symphysis at the front midline of your body. This allows for quite a bit of mobility. The two halves can slide up and down in relation to each other, inflare and outflare, as well as rotate one anteriorly and the other posteriorly in relation to each other. In yoga, we are often taught to square the hips, but let’s dissect that concept a little further given the above information. Here’s the first idea: the hips are only ever truly square when both of the legs are doing the exact same thing. Remember, a previous concept, wherever the foot goes so does the pelvis. So as long as both feet are doing the same thing, both sides of the pelvis are doing the same thing. As soon as one leg moves forward and the other one back, perfectly square hips no longer applies. But there are stages of its deviation, so let’s look at those. Stand in tadasana and feel your hips square to the front. Now step your right foot back into a short stance lunge with the back knee bent. Most people can keep their hips perfectly square, with some effort, in this position because the right thigh has not begun to tilt its ilium forward yet. But as soon as you take a longer stance or straighten the back leg, the hip extension reaches its maximum, pulls on the iliofemoral ligaments and begins to tilt the right ilium forward. It’s the movement at the pubic disc that allows this to happen without necessarily altering the left pelvis. In fact the left side may posteriorly tilt slightly as a counterbalance to the right side. But we don’t practice warriors with the back heel lifted, so go ahead and roll it down, but pause for just a moment. Remember that the foot and pelvis go together. So when you externally rotate the back foot down into its 30-degree angle, you are also going to outflare the right pelvis by about the same amount to avoid torque in the knee. To maintain the square to the front shoulder position in warrior one, roll the belly and the ribs toward the front in opposition to the rooting back leg and pelvis. Yes, there is a mini-twist inside Vira 1. Now what about warrior two? I like to begin this study from wide mountain pose facing the side of your mat. Turn your front leg out and your back leg in about 30-degrees. Notice that this immediately turns the hips slightly. Allow it! Doing so allows the front of your hips to stay soft, deepens the bend in your front hip for poses like triangle and side angle, and protects the front knee. I know this is in opposition to what many of you have learned as squaring your hips to the side wall, but let that instruction go for awhile and try this instead. Even out the horizontal alignment f your hip sockets so one is not lower than the other. And bend the front knee over the ankle lining it up to point toward the middle toe. Rotate your chest and shoulders toward the side wall and float the arms. Play with these ideas for awhile and let me know what you find. Happy practicing! Here is my question. In this stance as we flex at the hip joint the sits bone of the corresponding hip spirals out and the asis in. The femur rotates out. Because of the nature of the bone ryhthms does this not rotate the pelvis in the direction of the wall?